Back in 2014 we vacationed at Walt Disney World. Since this was going to be Kira's first trip, we went for 2 weeks. Pricing it out (as I tend to do), I found that getting two 10 day passes (for Michelle & Kira) and one Annual Pass (for me) would actually save us money, as the Annual Pass came with free parking. It also came with a MagicBand, but that was shipped to our house and didn't arrive until after I activated the Annual Pass in Orlando. 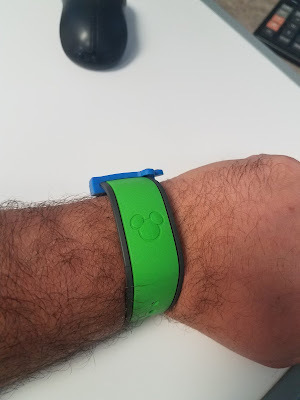 So, I had a MagicBand, but never really used it. Oh, I unlocked some stuff in Disney Infinity (1.0 & 3.0), but that was it. Now that we're planning our next trip to Orlando, and we're planning on staying On Property for the first time, we'll all be getting MagicBands. Therefore, I decided that I should get used to wearing something on my wrist again, as I've been doing without a watch for a number of years. I've noticed something now that I've been wearing this regularly. I actually feel better with it on. It's not any "The RFID creates and EM field with interfaces with your chakras" BS. No, it's purely a mental thing on my part, and I realize that. Heck, if I won the lottery I'd move to Orlando and spend pretty much all day, every day in the theme parks. So bringing a little bit of Walt Disney World with me every day just makes me feel good.